Everything Daniel draws with his pencil - flying dragons, Octobears, and pizza-loving aliens from the planet Beezo - comes to life. It's pretty awesome until the pencil draws a line between Daniel and his best (and only) friend Annie. What made the experience of listening to Daniel the Draw-er the most enjoyable? We listened to Daniel the Draw-er while on a short car trip. My kids (ages 4, 6, 9, 11) were enthralled the entire time. There was a lot of giggling going on in the car. As an adult, I enjoyed the book because of some of the funny references my kids might not have caught. The author did an excellent job of bringing Daniel and his friends to life. I hope there's a sequel! Can't wait to share with my first grader! What did you love best about Daniel the Draw-er? 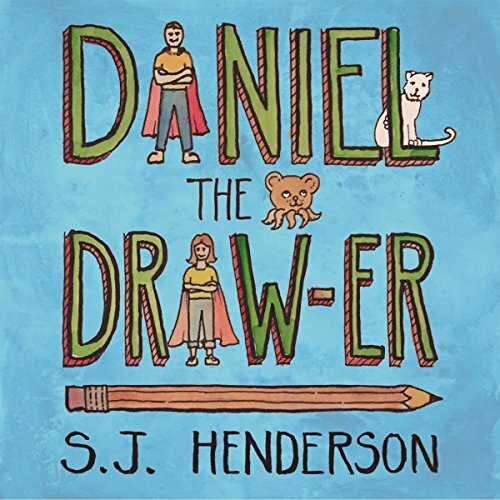 My favorite thing about Daniel the Draw-er were the vivid characters -- particularly the characters that were drawn by Daniel's magic pencil, but I also loved the sister's boyfriend. The humor caught me off guard sometimes and really made me laugh out loud. The superhero, Super Amazing Pants (SAP), and especially his nemesis, Doctor Short Shorts had the funniest names I've seen in fiction in a long time, and I like the way that Annie's drawing incorporated this slow realization that she's actually a real girl. What other book might you compare Daniel the Draw-er to and why? Diary of a Wimpy Kid or Captain Underpants, except that Daniel the Drawer has humor that's less disgusting. It compares because it's definitely aimed at the same group of kids. It speaks to them on their own level. It's even in first person, getting you that much closer to the kid in the story, sort of like a diary. Have you listened to any of Jay Prichard’s other performances before? How does this one compare? No, this is the first time I've heard his voice on audio book. I liked the voices he did for everyone except for Annie and Daniel. I think he slowed it down a little bit too much or something for them. It was hard to get past it enough to get into the story. Yes! I didn't have the time to do it that way, but it only took me three sittings. The theme of the book was lovely, too. I caught a couple of simple threads that will teach kids how to be confident about making new friends, and how to be nice to and value the ones they already have. When Daniel started to notice the slightly girly differences in the tomboyish Annie, he decided it was okay, and he still wanted to be her best friend. Annie is a real girl after all. This is adorable. Some of my favorite quotes: "I'm pretty sure nobody's ever been marshmallowed to death." "Annie has a certain reputation to keep. One that involves a taste for creepy, crawly, and peanut-buttery things. If anyone besides me found out there's an actual girl hidden inside, she'd never live it down." "It's okay, because none of us are perfect. All we can do is our best. Even if our arms are crooked or if we're missing one of our four eyes, if we're helping someone else, we're perfect." This audiobook was gifted to me in exchange for my honest review, which I have given. The story was interesting enough for me (an adult) to enjoy thoroughly including a few laugh out loud moments but (I'm assuming) appealing enough for the kid set - a robot that makes pizzas AND does math? Who doesn't want one of those? I like the pure, crazy-pants imagination of Daniel and how he learned both about what it means to be a friend AND how what you wish for (or draw) might not always turn out exactly as you'd thought (Super Amazing Pants?). What does Jay Prichard bring to the story that you wouldn’t experience if you just read the book? I really enjoyed the voice Jay brought to Daniel's various drawings, particularly Whiskers and SAP. I really like the description of Daniel's and Annie's friendship, both the breaking and repairing. This book was a lot of fun and would be a great road trip story for anyone with kids five and up. It's engaging enough to interest the young 'uns and fun enough that even the adults will enjoy it. I was given this audiobook in exchange for honest review. This is a great for all ages story delivered with perfection by the narrator Jay Pritchard! Where does Daniel the Draw-er rank among all the audiobooks you’ve listened to so far? Daniel the Draw-er is actually the first audiobook I've listened to on Audible, and I enjoyed it. The book seemed a wee bit long to me. If I were a young person, I think I would have loved it and been sorry the story ended. I can't think of any recent books I've read to compare this book to, but I was reminded of the great enjoyment I got from listening to my teachers read books in class. It was always a welcomed break from the usual classroom fare. Daniel the Draw-er kept me on my toes. I found the story quite imaginative and delightfully detailed. This is the first time I've heard Jay Prichard's performance. I feel pleased by his reading of the book and the portrayal of the characters. His reading seemed natural and pleasant to me, not at all distracting. Daniel, of course, he was a nice boy who had a good heart and a lot of patience for a bully of his sister's friend and huge imagination. What about Jay Prichard’s performance did you like? he was easy to listen to and easy to understand, he made the book very enjoyable. Absolutely adorable and fun read! Would you consider the audio edition of Daniel the Draw-er to be better than the print version? Listening to the audio version was great! It was as good as the print, I'm sure! What was one of the most memorable moments of Daniel the Draw-er? My favorite parts were with Whiskers. But I loved Annie too! I haven't listened to any of his other titles. I loved when Annie and Daniel helped each other in the end. It was a very adorable, and realistic, moment of friendship. I really enjoyed listening to this one in the car with my toddler and he seemed to enjoy it too. I haven't read/listened to a lot of middle grade books yet but this will be one I come back to with my son because it's so inventive. The narrator was great, captured the voice well and Daniel especially is wonderful! I read the printed version before I enjoyed the audio edition of Daniel the Draw-er. The audio version put a different twist on the characters that I had developed in my head. The reader did a good job with the different characters throughout this book. I loved Daniel. Daniel seemed content with having one friend and his world of make believe. We all need to learn a lesson from him. If we have one good friend, we have everything! I have never listed to Jay Prichard before. It took me a while to get used to his reading style. It is possible, that because I have not listened to a children's book in a few years, I was thrown off by the simplicity of his monologue. He seemed to be reading to very young children. As the story went on, I got used to his performance. I giggled over many parts of the book. Having three sons, I could see the happiness, disappointments and excitement that Daniel expressed. He is a very likable boy. I look forward to many more adventures with Daniel!! This was my first book for adolescents I've listened to, and I REALLY enjoyed it! I liked Annie for being both a tomboy and a girly-girl and Super Amazing Pants was so funny! It was a little distracting for PIZZA-BOT to be called P-eye-ZA-BOT, but I've only listened to the book and not read the actual book. That may be what he was supposed to be called? I did grow to appreciate the different ways he used his voice for the unique characters. I really enjoyed listening to this book. A great story line that I think both boys and girls would be drawn to, no pun intended. I loved the little parts in the book that were so descriptive, like Tommy's mustache looking like a caterpillar and Annie having a jack-o-lantern smile.